The longest and most important holiday in China is the New Year’s celebration. It is called the Spring Festival and lasts for two weeks. The festival traditionally begins on the 23rd day of the twelfth month and continues until the 15th day of the first month in the Chinese lunar calendar year. The 15th day is celebrated with The Lantern Festival and signals the end of the holidays and the beginning of spring. It is a time of family, food, and celebration. The business world shuts down for the holiday so that workers can spend time with their families. People celebrating the Chinese New Year practice century old traditions, such as the elders giving children red packets filled with money for good luck, eating dumplings, gift giving, lighting firecrackers and watching firework displays. The Lantern Festival is most closely related to our Valentine’s Day. In ancient times this holiday would be one of the few times women were allowed out and were able to mingle with eligible single men. Although social customs have changed drastically since then, the Lantern Festival today is still a day of love and romance. The paper craft featured is a Chinese style paper lantern. It would be a fun craft to make with your children helping them learn more about the country of China and its traditions. After making the lamps, have a party with dumplings, gifts, and firecrackers to celebrate the Chinese New Year! This lantern is strictly decorative and should be hung for display only. Please remember always to use common sense and do not attempt to add a candle! Download the zip file containing the PDF cutting template here. Unzip the file into your choice of folder. Print the pdf template onto one side of the 8.5 x 11 sheet of red card stock. The printed side will be the underside of the sheet. Using the ruler and X-Acto knife, cut along the printed cut lines. Score the top and bottom fold line with a ruler and bone folder.Fold the top and bottom of the red sheet of card stock on the fold lines, and bend towards the front. Using the ruler and X-Acto knife cut along the cutting lines. Score the top and bottom fold line with a ruler and bone folder.Fold the top and bottom of the red sheet of card stock on the fold lines, and bend towards the front. Cut 10 .25' x 7' inch strips out of the gold glitter card stock with a craft knife or scissors and ruler. Glue a gold strip on every other red band as in the photo above. You can use a glue runner or tacky glue for this step. I have found that tacky glue has better adhesion but takes longer to dry. Cut a 10.5" x 10.5" square out of the gold glitter card stock. Using a ruler and pencil or pen, draw the measurement guides. Use the photo above as a reference. The top right box is where you apply your glue. The bottom area is the fringe section of the lantern. 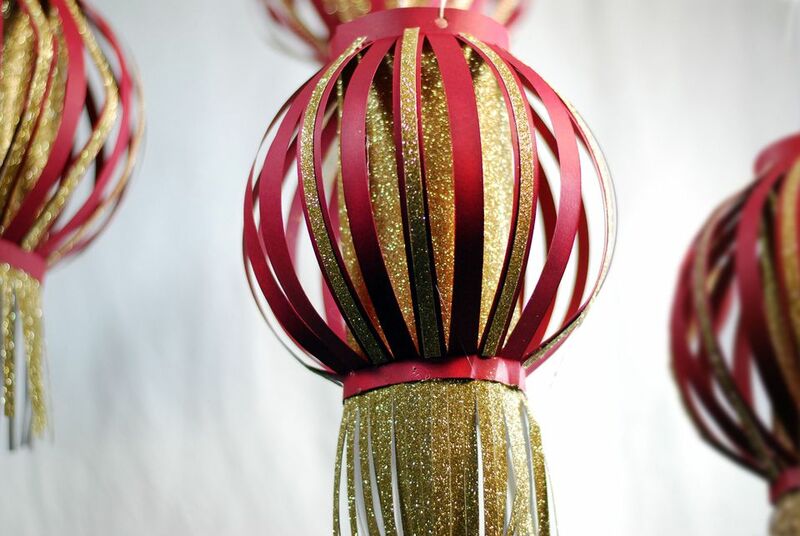 Cut the bottom paper fringe of the lantern with a ruler and X-Acto knife. Roll the gold glitter paper as in the photo above and glue edges together with a hot glue gun. *A quick tip. Hot glue will have a stronger, more secure bond on glitter paper than other types of glue. Using a hot glue gun attach the top of the red card stock to the top of the gold cylinder. Place a bit of hot glue to join the bottom edges of the red card stock. Slowly pull the red card stock upwards forming the balloon shape of the lantern and secure with hot glue. Punch two holes on the top using a paper punch. Run light wire through the holes to make a handle. Hang the beautiful lanterns and enjoy! Make several Chinese paper lanterns and hang together to make a stunning display! So pretty! So festive!